This is something the Center for Science in the Public Interest has been flogging for a while but seems to be finally gaining traction. The Daily Green noted today that the state of Maryland may soon be the first state to require labeling on food items containing artificial colors with the possibility of banning them as soon as 2012. For the record, the colors in question are popular versions of blue, green, red, orange and yellow coloring. A veritable rainbow of poison. In Europe, regulators and industry have made considerable progress toward eliminating artificial dyes from food products, though American versions of the very same products continue to get their colors from synthetic dyes. For instance, the syrup in a strawberry sundae from a McDonald's in the U.K. gets its red color from strawberries; in the U.S., the red color comes from synthetic Red 40. 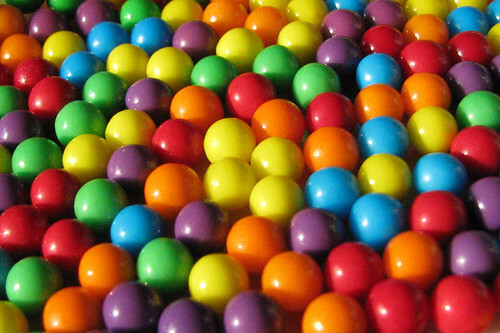 In the U.S., synthetic food dyes are common in brightly colored foods popular with children, including candies, soft drinks, breakfast cereals, and snack foods. Sometimes the sunny synthetic colors are designed to simulate fruits or vegetables, as in the case of a "Guacamole Dip" produced by Kraft, which gets its green color not from avocados but from Yellow 5, Yellow 6, and Blue 1. The "artificially flavored blueberry bits" in Aunt Jemima Blueberry Waffles are blue thanks to Red 40 and Blue 2, not blueberries. Indeed, General Mills, Kellogg, Kraft and McDonalds all replaced the harmful dyes in their British products. Even Fanta now uses pumpkin and carrot extracts to color their soda orange in the UK. And you know what? The world didn't end. Nor did the companies go out of business. There's not even any indication that eliminating dyes caused price increases. In fact, no one really noticed, which begs the question of why the colors are used in the first place. We're running out of excuses, folks. Thankfully, we can always rely on the medical community to come up with a doozy when required. How about this one from the NYT article on the dangers of food additives from last year. Expressing doubts about the risks vs benefits of banning these additives, a pediatric psychopharmacologist at Mass General Hospital asked, "Is [the effect] powerful enough that you want to ostracize your kid? It is very socially impacting if children can't eat the things that their friends do." That's right. ADHD is bad and stuff. But no candy and soda? That's just outrageous! If this is the wisdom coming out of the medical profession, it's no wonder the FDA drags its feet. They're afraid they might bum us all out. I think my favorite line is "a veritable rainbow of poison"
Actually, the social consequences for children of eating 'strange' food is surprisingly well-known in marketing circles. Creating similar but 'better for you' versions of popular kids foods is a common mission, often not completed, for food companies large and small. I worked at a company that produced foods for children with allergies. In market research parents told us repeatedly that they wanted their allergic kids to be able to take foods to school that looked like 'conventional' foods. We received many pleading emails saying the same things. That's not to say those colors shouldn't be banned. They should. But Big Food needs to care more about health and less about the bottom line...and that's just not going to happen without government regulation or CSPI lawsuits. Linsey, I have no doubt you speak truth. But the fact that so many parents are reluctant to hold the line against peer pressure, even if it's the only way to avoid poisoning their own kids, just isn't a good excuse for Big Food to keep producing the poison. Government regulation? Heck, yeah! She began to treat his condition by buying food products that did not have these dyes in their products. For example, she switched from a popular brand of peanut butter to organic peanut butter. She also found that only Pepperidge Farm products were free of these dyes. She eliminated all juice drinks and any product with these dyes shown on their labels. Results were noticeable to the point where her soon never went on any meds, because they did with just a regulated diet that eliminated the dyes. My nephew ultimately managing his own diet because even he noticed the difference whe he ate the wrong foods. Why are we medicating our children when we can modify, adjust, and yes, even make them eat healthier. So, as parents, you have decided by the demands of your own children that you should start listening to their peers for guidance on what is healthy for your family. You've already given up your rights with cell phone usuage, text message mania, and Coach handbags as entitlements. But to give up your child so they fit in? Fit into what? A drug induced society where everyone is bouncing off walls unless they are druged up (drug companies love you)to control the thing that they could have controlled through reading labels and watching the food intake of their children and themselves. If we aren't watching out for ourselve, no one is or will be. We are capitalists with a capital letter C for " Can't care about health or welfare when it's all about the bottom line - Money. Profits. Wall Street. Also, I highly recommend the documentary called Food, Inc. You can order it through Netflix. It was up for an Academy last week, too. You'll never want to eat another piece of beef, chicken, or pork ever! Our food supply is compromised in this country and we sit there like "lambs to the slaughter" (sorry for the pun, but it true) and just gladly eat the crap they call food in it's pretty pre-packaged, pre-processed boxes. You're better eating the box than the pretty food is in...well, maybe not...there's probably dyes in the carton.